VELOUR KAFTAN - Rich Ruby-Wine colour with a white two tone design. It has a lovely silky feel on the inside with a slightly crushed velour on the outside. The kaftan is of excellent quality with a really good drape. The standard cut of this kaftan is gradually tapered inwards from the top down to the hemline. This style maximizes the appearance of the very attractive drape of the garment. 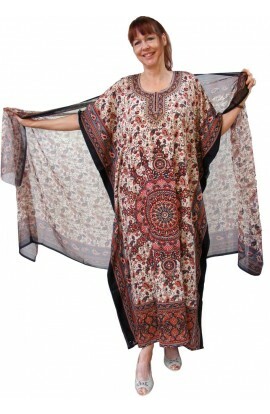 The standard size of this kaftan is suitable to loosely fit any UK dress size between 14 and 28. However, we are always happy to provide a smaller or larger version for anyone who requires our Bespoke made to measure service. The three standard lengths are 49”, 53” and 57”, but again, we can provide any length required as a Bespoke version.